Bringing cutting-edge data analysis and collection techniques to the attention of resource managers is a key strategy in planning for sustainable fisheries. Exposing recent graduates to the ins and outs of a resource agency’s protocols while doing so? That’s a strategy for a sustainable fellowship. Those were the goals when North Carolina Sea Grant’s former executive director Ronald Hodson joined Preston Pate, then director of the N.C. Division of Marine Fisheries, to inaugurate the Marine Fisheries Fellowship in 2002. Over the last 15 years, the 11 fellows have helped answer critical questions regarding resources and management specific to the agency’s needs, and directly relevant to the state’s important fisheries. Dexterity with the “latest and greatest” in data visualization software is among the valuable skills that fellows can bring, notes Jeffrey Buckel, a fisheries biologist at North Carolina State University’s Center for Marine Sciences and Technology. “For some of the fellows, it’s the technical stock-assessment approaches to analyze fish population dynamics, or the latest statistical analyses that may yield less biased results,” adds Buckel, who also serves as their academic mentor. The fellowship is open to graduate students from Maryland to Texas. Meet four former fellows, all continuing research from here in North Carolina, to the continental shelf of Florida, and even the coast of Oregon. As the first N.C. marine fisheries fellow, Nathan Bacheler would not have guessed that 22 scientific publications, 15 conference presentations and numerous research grants later, he would go to Washington, D.C., in 2016 to be recognized by former President Barack Obama as an exceptional scientist. “My fellowship on striped mullet was my first foray into marine fish ecology and management — and I’ve been hooked on marine fish ever since,” he recalls. As a fisheries biologist at the National Oceanic and Atmospheric Administration’s National Marine Fisheries Service in Beaufort, North Carolina, Bacheler coordinates the Southeast Fishery-Independent Survey, a monitoring and research program targeting reef fish in U.S. continental shelf waters between North Carolina and Florida. Nate Bacheler confirms a placement plan before deploying fish traps during a NOAA research cruise. Photo courtesy Nate Bacheler. The group collects abundance, size, age and reproductive information on economically important reef fish, such as snapper and grouper, he explains. The data — such as distribution and habitat-pattern assessments — inform stock assessments and ecosystem-based management plans. In 2016, Bacheler served as the chief scientist on Pisces, a research ship used by NOAA’s southeast survey group. Working at sea, aboard a vessel for several weeks each year to deploy traps and devices for sampling, may not be everyone’s ideal foray. But for Bacheler, his first experience as a seafarer during his graduate fellowship was a highlight. For the fellowship, Bacheler analyzed large-scale tagging datasets of striped mullet in North Carolina to examine movement patterns and mortality rates. These estimates would help inform the state’s stock assessment for the species. Bacheler’s analyses contributed to the state’s fishery quota for striped mullet, a favorite and widely used bait. His methods to analyze survival rates — derived from approximately 15,000 tags, with additional monthly movement data on nearly 400 recovered individuals — continue to be a core part of the striped mullet fishery management plan, DMF’s Duval notes. “It was my first opportunity to analyze tagging data, which I enjoyed so much, I conducted my own large-scale tagging and telemetry project on red drum for my doctoral research,” Bacheler adds. He continued to work with mentor Buckel, obtaining a doctoral degree in zoology from NC State. 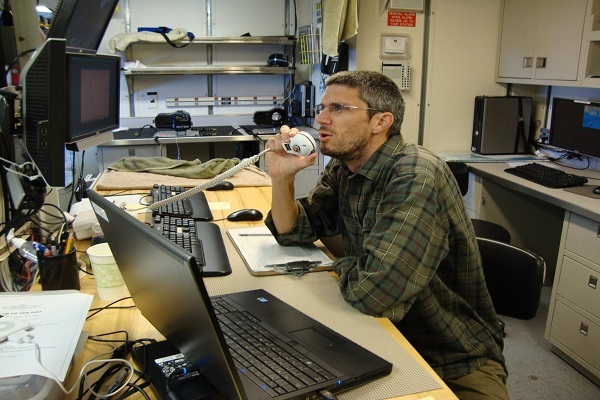 After postdoctoral research at Oregon State University, and a one-year stint as an assistant professor at the University of Wisconsin–Green Bay, he returned to North Carolina, beginning his career at the NOAA Beaufort Lab. In May 2016, Bacheler was awarded a Presidential Early Career Award for Scientists and Engineers, the highest honor bestowed by the U.S. government on science and engineering professionals getting started in their careers. As a 2005 fellow, Summer Burdick studied long-term tagging datasets of North Carolina red drum — the state saltwater fish, designated by the N.C. General Assembly in 1971. North Carolina has produced 10 of 16 world-record-sized red drum, and has small commercial and recreational fisheries for the species. Working closely with Joe Hightower and Ken Pollock, faculty members of NC State’s Department of Applied Ecology, along with DMF biologist Lee Paramore, Burdick analyzed 25 years of tagging data. The information came from commercial fishermen and recreational anglers, as well as agency researchers, regarding nearly 42,000 red drum in North Carolina. Summer Burdick, now a fish biologist with the U.S. Geological Survey, studies endangered fish species in Oregon. Photo courtesy Summer Burdick. “Using that dataset, we were able to estimate patterns in survival rates, recreational and commercial discards, and gear selectivity,” Burdick explains. Gear selectivity, or the ability to target and catch fish by size or species, was critical for the red drum management plan at the time, she notes. Burdick’s work contributed to the 2007 stock assessment, which used gear-selectivity estimates for all size classes of red drum, and survival estimates of adults. Though technical skills were critical lessons, some of Burdick’s favorite fellowship moments — such as catching rare views of sharks and sea turtles while accompanying other research trips — stem from being a part of CMAST in Morehead City. The NC State graduate now is back in her home state of Oregon. As a fish biologist with the U.S. Geological Survey in Klamath Falls, she studies endangered fish species in high-elevation Oregon lakes. “I’ve been here just over 10 years, and most of my research has focused on two endangered sucker species — lost river and shortnose — which aren’t surviving their first year of life,” she explains. 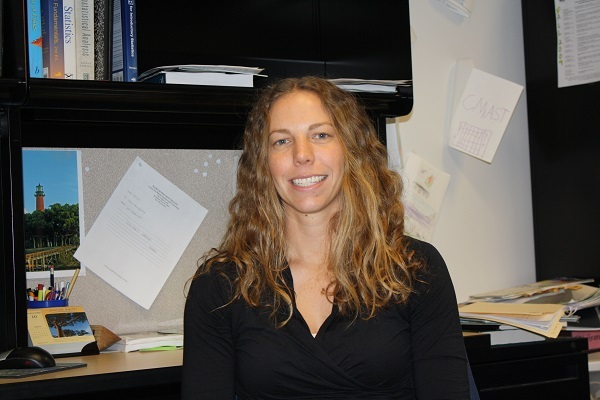 Developing the skills for quantitative analyses of long-term datasets, the primary focus of her fellowship, launched her career, Burdick adds. “Coming out of my graduate project, I had several classes in quantitative statistics, but hadn’t applied them anywhere,” she explains. The next step — to her current position at USGS — was “jumping into a similar type of analysis,” she explains. Mapping the many habitats important to state fisheries involves extensive data collection, sophisticated computer software such as geographic information systems, or GIS, and the skills to blend both components into a spatial analysis. During her 2009 to 2011 fellowship, Jennifer Weaver analyzed the DMF fisheries-monitoring numbers collected from the Pamlico Sound. The statistics would be incorporated into data collections used in reviewing potential designation of strategic habitat areas, or SHAs. When her DMF mentor moved to another position, Weaver’s background in spatial analysis from Duke University’s coastal environmental management program primed her to tackle the job — accomplishing more than she, or DMF, had anticipated. Jennifer Weaver has traveled to Louisiana and California to assist with oil-spill response and recovery. Photo by Jeffrey Buckel. Weaver became the primary GIS analyst for the SHA designation recommendations for the Pamlico Sound system, known as Region 2 within the state’s Coastal Habitat Protection Plan. In the plan, SHAs serve as representative portions of each unique habitat of North Carolina’s coastal system. Weaver’s task was to identify potential SHAs that provide exceptional habitat functions, or are at risk due to threats, vulnerability or rarity. Weaver assembled a GIS database of fish habitats and used geospatial and modeling techniques to summarize trends in fish abundance. Working with data on 35 distinct habitat types and 24 alteration factors, or negative impacts, she also utilized a site-selection program to recommend a network of areas for SHA designation. After a committee of fishery managers corroborated the results, 67 areas were nominated as SHAs, and data was incorporated into state conservation and restoration planning efforts. 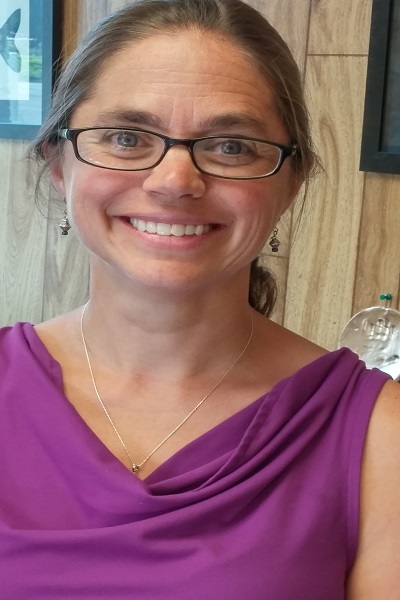 As a coastal ecologist with Research Planning Incorporated in Columbia, South Carolina, Weaver now primarily works in resource mapping and risk assessment, focused on oil spills and response planning, she explains. In her current position, she often synthetizes and analyzes data — skills honed during the fellowship. “A large part of my job has been ESI mapping,” she notes. Weaver uses Environmental Sensitivity Index, or ESI, maps to provide a summary of coastal resources that are at risk if an oil spill occurs nearby. The mapping involves communicating with local stakeholders to process data to generate ESI atlases, she explains. “Having worked with DMF and a variety of stakeholders through a planning process gave me a hard knowledge of how state agencies work, as well as the interpersonal skills to present that type of information, and facilitate that type of meeting,” she adds. During her five years at RPI, Weaver has served as a biologist for seven ESI projects on coastal zone management, contingency planning, and hazardous-material or natural-disaster responses. She also served as a member of NOAA’s Scientific Support Team as a responder to oil and hazardous material spills for four years. More recently, Weaver has worked with long-term restoration planning teams to develop and scale fishery-based projects that would compensate the public for fish lost during the spill. A fellow from 2011 to 2013, Jody Callihan now is a fish biologist with the Federal Energy Regulatory Commission, an independent agency that manages interstate transmission of electricity, natural gas and oil, based in Washington, D.C.
Jody Callihan’s fellowship focused on developing a mapping template to visualize striped bass tagging data. Photo courtesy Joshua Raabe. In the first year of his fellowship, the Louisiana State University graduate developed a GIS template to help fishery managers visualize long-term tagging data for the Albemarle Sound-Roanoke River population of striped bass. The template enabled tag-return locations to be plotted and visualized by season, size or other parameters. Managers could use such a template for future data that come in from the tagging program, and for other species as well, Callihan explains. 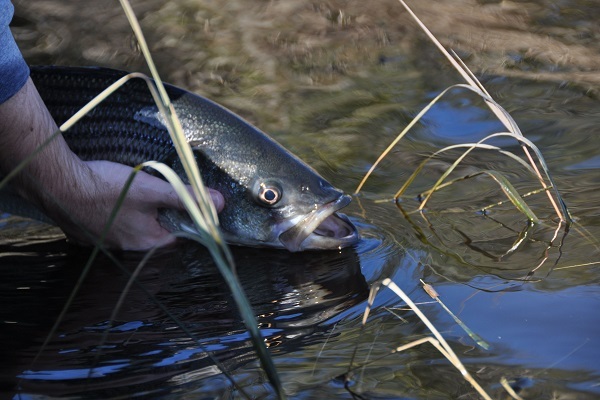 Results from Callihan’s work contributed to the state’s stock assessment to account for striped bass movement outside of the previously assumed stock boundary. The work also demonstrated the potential contribution of the Albemarle Sound striped bass stock to the Atlantic Ocean migratory stock. In his two years as a fellow, Callihan’s research contributed to two reports on the migration patterns and stock of striped bass. The initial tagging data also became a platform for Callihan during a one-year postdoc with Hightower at NC State. The fellowship research revealed a pattern of large adult striped bass migrating to northern ocean waters after spawning, Callihan explains. Using radio receivers placed along the Roanoke River and portions of the Atlantic Coast, the team was able to fill in gaps about the timing of that migration, and whether the stock returned to the same spawning system the following year. A third report was published with results of his postdoc research. For links to research publications from the N.C. marine fisheries fellowship projects, view the online version of this story at nccoastwatch.org. Liza Hoos presented her fellowship research a the International Marine Conservation Congress. Photo courtesy Liza Hoos. The most recent N.C. marine fisheries fellow, Liza Hoos, analyzed data collected by the N.C. Division of Marine Fisheries to identify areas where endangered species, including Atlantic sturgeon and sea turtles, are caught in gill nets. During the fellowship, she worked to develop maps that designate “hotspots” where these incidents occur. Her maps may help fishery managers determine ways to reduce bycatch of these species, while allowing gillnet fisheries to continue. Her analyses already have been incorporated in management strategies for setting closure areas, notes Jeffrey Buckel, a fisheries biologist at NC State University’s Center for Marine Sciences and Technology and Hoos’ fellowship mentor. Her fellowship also involved documenting the location and timing of fishing closures, and how those may affect bycatch reduction. 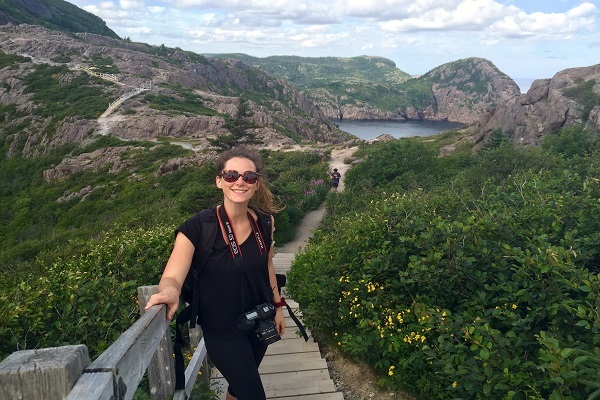 In 2016, she traveled to California and Canada to present her research. Her fellowship ended in November 2016.